If you've played any of Zen Pinball tables before, you know what you're getting into with their latest addition to their series. Each of their tables are brilliantly crafted, the sounds and lights are all so immersive, and the gameplay is always challenging yet rewarding. Zen Studios really played their cards right with Disney some years back. There are a huge amount of Marvel tables and also Star Wars ones available. You can tell you're dealing with an authentic game as soon as you load this one up. The art is amazing and detailed, simply stunning if you pause a moment in the pinball action to take it all in. John Williams classic and iconic soundtrack scores this game to get you right into the universe. The soundtracks for both games only feature music from the original movies, I would like to have heard Rey's Theme or the March of the Resistance (yes, I am a SW nerd and I listen to the soundtrack almost daily). The voice acting is spot on, I often wonder if that is Daisy Ridley telling me she is disappointed I lost another ball. Not really, but it is pretty good. Even Kylo Ren convinces me I'm doing the right thing working for the First Order. Sound effects bring you right into the SW galaxy. Lightsabers, BB-8's garbled sounds, Falcon's speeding by... it is pretty good fan service. As for gameplay, if you've liked Zen Pinball tables in the past, you'll dive right into this one. At first I thought the First Order table was a lot like the Portal one but the more I played the more unique it became. The "inner" table for this one is easy to get to so you feel successful from the start. The action progresses as you seek out Resistance members and capture them. 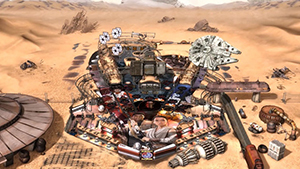 For the Rey table, you follow the scavenging storyline, rescuing BB-8, finding scrap, taking off with Finn in the Falcon, and even confronting Kylo Ren. For 5 bucks you cannot go wrong! Two tables? Great Star Wars fan service, engaging storyline, and challenging gameplay make this table an easy buy. Thanks to Zen Studios for the review codes for this one, although I bought it before I could use them! Look for a code giveaway in the next couple of days!